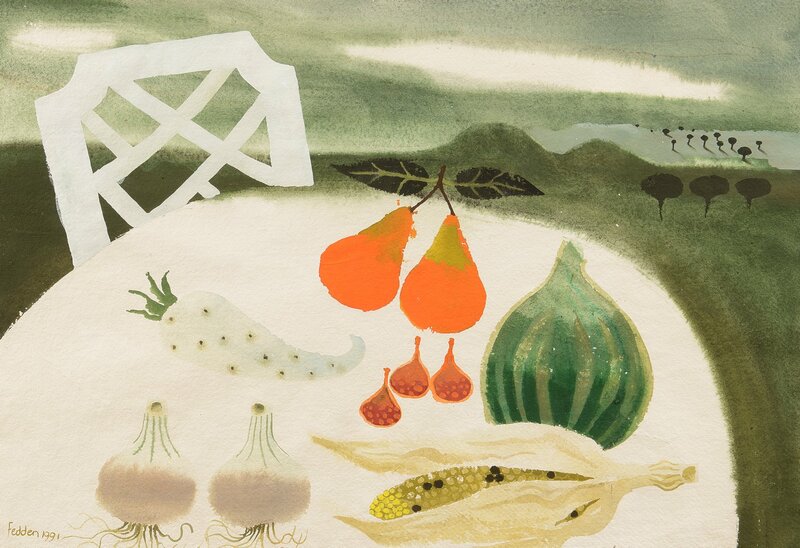 In this beautiful work Mary Fedden has combined her love of still-lives with her love of landscapes. In the foreground pears, onions, figs, melon and corn are artfully arranged on the table whilst, in the distance, a hilly Tuscan landscape can be seen. 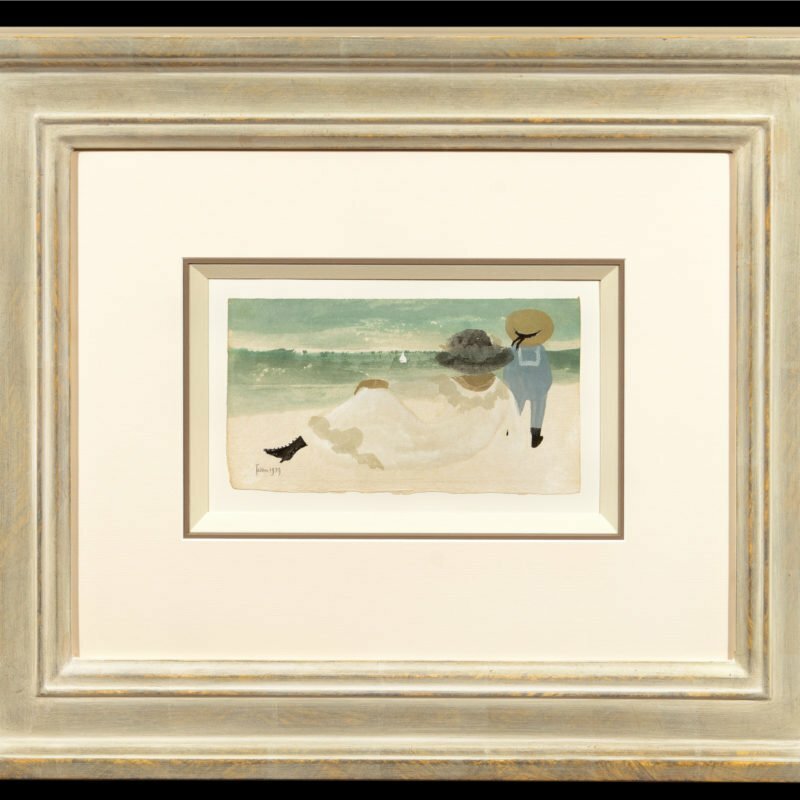 This combined with a harmonised colour palette lends an air of tranquillity to the scene. 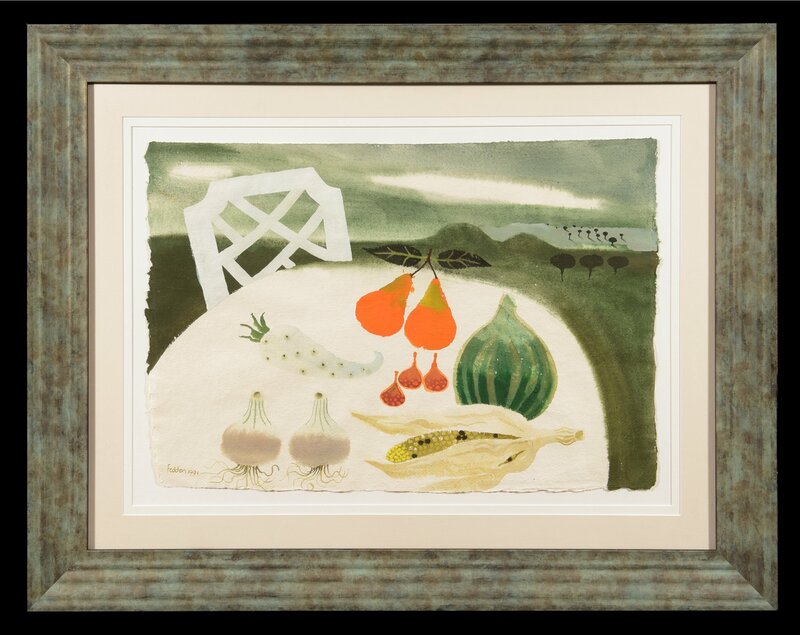 Mary Fedden was a prominent Modern British artist known in particular for her intriguing still lifes, of which Still Life with Pears, Onions and Corn in a Tuscan landscape, 1991 is an excellent example. Throughout her life Fedden remained adamant that the arrangement of objects in her paintings were not symbolic of anything but rather that they are simply objects that she loves to paint, again and again. Art historian Christopher Andreae has suggested that her still life works can be seen as her personal ‘cabinet of curiosities’ (Andreae Christopher, Mary Fedden: Enigmas and Variations, Lund Humphries Publishers Ltd, London, 2009, p.118). As the artist has explained, ‘I come back from holiday with sketchbooks full of landscapes … and then I’m back to still life. It’s my real love’ (quoted in Andreae 2009, p.118). 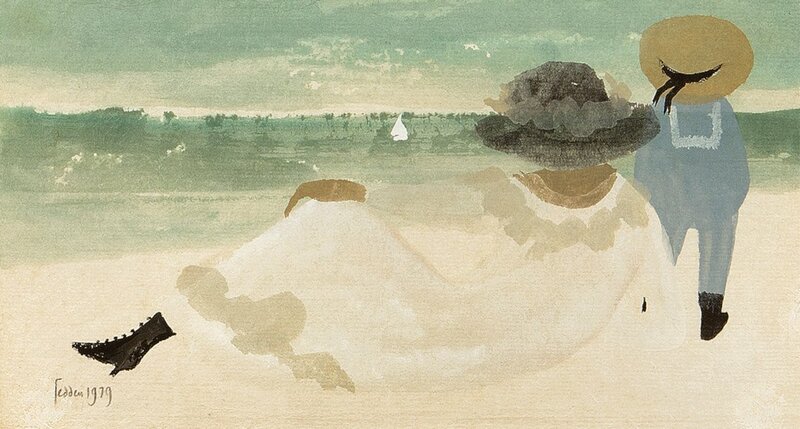 Mary Fedden was born in Bristol, and attended the city’s Badminton School, until she left at age sixteen, to study at the Slade School of Art, from 1932 to 1936. After leaving the college she lived between London and Bristol, and made a living teaching, painting portraits and producing stage designs for Sadler’s Wells and the Arts Theatre. At the outbreak of the Second World War, Fedden served in the Land Army and the Woman’s Voluntary Service and was commissioned to produce murals for the war effort. In 1944 she was sent abroad as a driver for the Navy, Army and Air Force Institutes. After the war, she returned to easel painting and developed her individual style of still life painting, partially inspired by Modern painters such as Matisse and Braque. In 1951 Mary Fedden married the artist Julian Trevelyan, whom she had met before the war. They took a studio on the Thames River at Chiswick, where Fedden lived and worked until she passed away. Together, Trevelyan and Fedden travelled widely and even collaborated on a mural commission for Charing Cross Hospital. Fedden received several other commissions for murals, most importantly from the Festival of Britain (1951), the P & O Liner, Canberra (1961) as well as from schools and hospitals. From 1958-1964 Fedden taught at the Royal College of Art and was the first female tutor in the Painting School. Her pupils included David Hockney and Allen Jones. Subsequently, Fedden taught at the Yehudi Menuhin School in Surrey, and was elected Royal Academician. From 1984 to 1988 she was President of the Royal West of England Academy. She was awarded an honorary doctorate from the University of Bath, as well as the University of Durham, and an O.B.E. for her work.